Hallado en la ciudadela de Ammán. This unusual tripod bronze censer is apparently of cast bronze, body lid and handles being made separately. The body is cylindrical with a disc base that projects beyond the cylinder, thereby making a flange to which three legs are attached. There is another flange at the top with three ornamented projections, each pierced with a small hole. The place of the fourth projection is taken up by the hinge which holds the lid on. 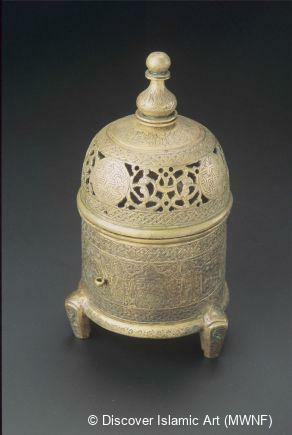 The dome-shaped lid, with an arcade in the drum, has three holes cut into the dome; the dome is surmounted by a knob. 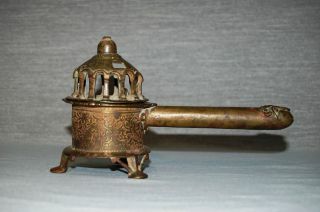 The handle is a tube ending with the simple shape of a lion's head, attached to the body by three rivets and placed between two of the three legs, which makes the whole piece unbalanced and prevents it from standing firm. 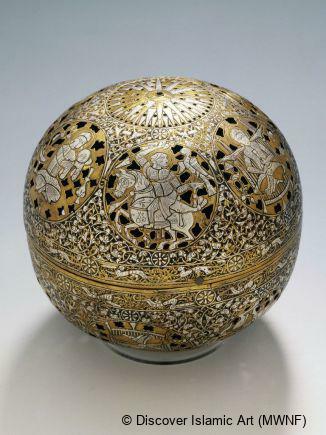 The body and dome are delicately engraved with a formal floral design on a background of fine dots. 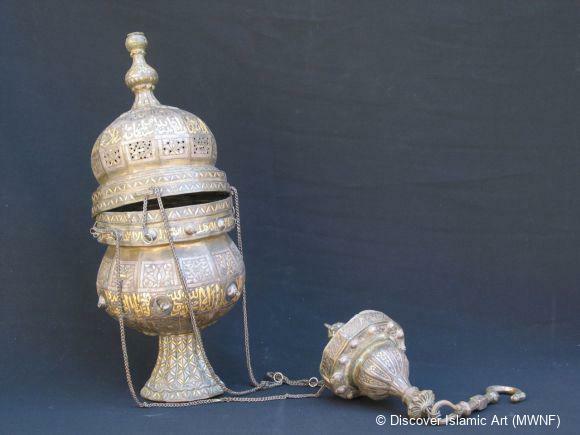 The primary uses of incense are olfactory: to create a pleasant smell; enhance a particular mood; to rid a space of bad odours and for spiritual purposes. 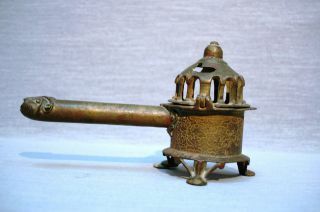 A tripod incense burner of cast bronze from the Amman Citadel. The body, lid and handle were all made separately. 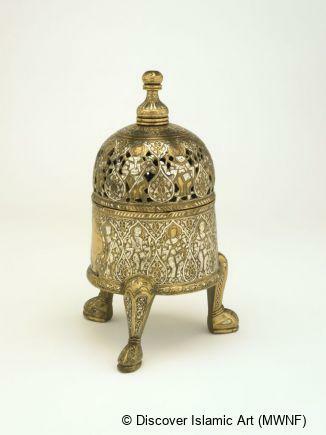 The dome-shaped lid is attached by a hinge and decorated with an arcade; the handle ends with a lion’s head. The object was dated by where it was found: the Citadel of Amman in an Umayyad house, room D, where Umayyad pottery vessels were also found. 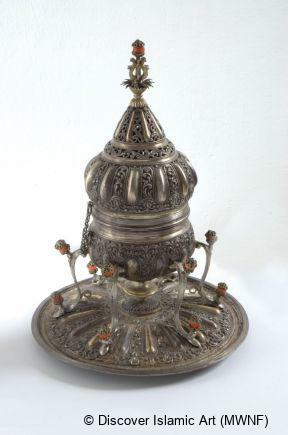 It is also dated by stylistic analysis of both the form and decoration. 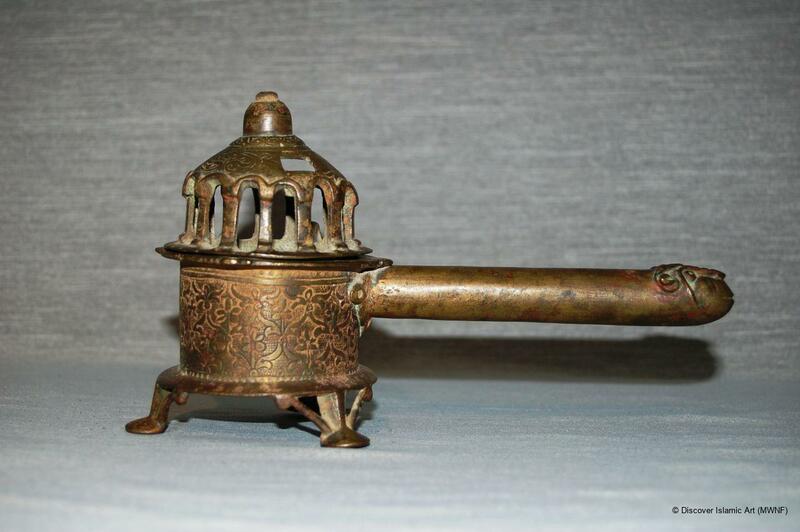 The object was obtained as a result of an archaeological excavation that was carried out in the Citadel of Amman during construction of the Jordan Archaeological Museum in 1949, when a courtyard and several rooms of a large house dating to the early Umayyad period were revealed. The provenance of this object is unknown. Harding, G. L., “Excavations on the Citadel, Amman”, Annual of the Department of Antiquities of Jordan, Vol. I, 1951, pp.7–16, plate II, cat. no. 4. La voie royale: 9000 ans d'art au royaume de Jordanie, exhibition catalogue, Paris, 1986, p.276, cat. no. 371. Aida Naghawy is an archaeologist and the Director of Jordan Archaeological Museum. She studied archaeology at the University of Jordan where she gained her MA. She was affiliated to the Jordanian Department of Antiquities from 1974 as a curator of Jordan Archaeological Museum. In 1981 she became inspector of Jerash antiquities and co-ordinator of the Jerash International Rehabilitation project. She was also head of the archaeological awareness section at the Department of Antiquities. 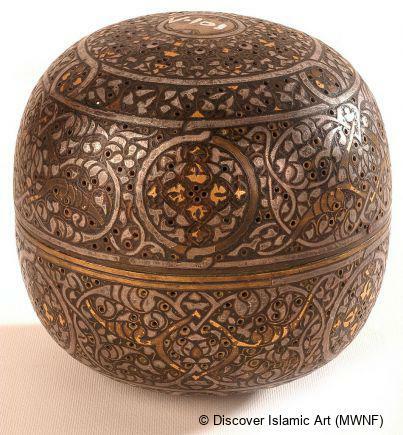 Aida is the author of numerous publications on Islamic coins. She has carried out excavation work in Jerash and is the founder of Jerash Archaeological Museum and the Islamic Museum of the Ministry of Awqaf and Islamic Affairs.